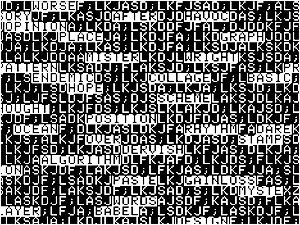 Imagine working on a screen space of 40 columns x 24 rows of pixels and using a programming language that was so simple that it invited play. Welcome to the world of the Apple IIe (circa 1983), a personal computer and operating system (AppleSoft Basic) that gave you such simple resources, along with the ability to easily manipulate them, that it inspired poets such as Geof Huth and bpNichol to make words dance on the screen. This collection of minimalist poems maximize the potential of the Apple IIe screen and are mesmerizing. Don’t look away for a moment or you might miss something super cool.